I started to type an apology for not posting for a while, but I’m not going to. I’ve been busy. For a while there Utah, (and pretty much everywhere else in the country) decided to take a break from winter and I found myself basking in the sun in shorts and a t shirt in 65 degree weather. Going running in a tank top and being HOT. It was nice for a bit and I found myself looking up plane tickets to Costa Rica to plan an upcoming spanish-and-surfing getaway. But then I remembered what season it really is… oh yeah. Thankfully, this past weekend a “weak” storm started to blow in (accompanied by craaazy winds…. and yes, they were in fact TOO strong to speedfly in.) We got a decent amount of snow on thursday, but it didn’t make the dust on sheet-of-death-ice skiing that good, so I resumed my spot in front of the computer googling various tropical getaways. But then after another decent sized storm came through Friday night- the report called for 2-4 inches, I think, with a bit more during the day… but I was bored so I went up early anyway. I had a GREAT day! I love it when storms actually overproduce- (or somebody underestimates…) it’s such a nice surprise. But then…. it kept COMING. A long day Saturday turned into an early day Sunday where I had quite possibly the best day of the season. This is my favorite time at Alta, having a huge base (130 inches, ish) plus a couple feet of new snow, means you can jump off everything. It’s awesome. So needless to say, I’ve had a great couple of days. Really what I needed right now as I’ve been feeling less than motivated lately. The sun is starting to peek out so I’m excited what the next few days will bring. What else? Completely unrelated, but I got the best surprise from my parents ever! Meet my new appliance love. Some are surprised to learn I have a huge love for baking. Not cooking, I mean… I try…. but baking is really my calling in the culinary world. I’m a fat kid at heart for sure. Sometimes I dream of just starting one of those cute trendy baking blogs. I’d call it “crushing cupcakes” or something stupid like that. It would be awesome. And I’d probably get fat. Oh! And I got a new phone! After much deliberation I joined the cool people smart-phone club. Except mine is supposedly waterproof and shock proof, which is essential for me. But no, I will not be facebooking on my phone- because facebook is bad for you! Sweet! 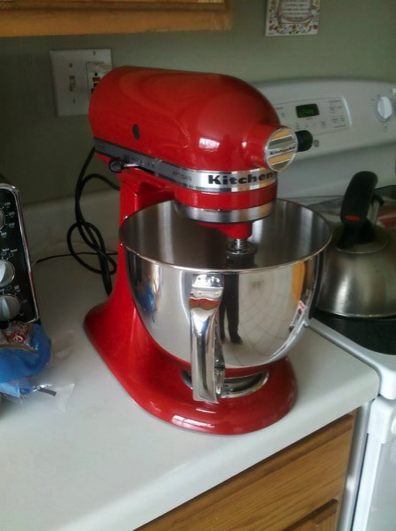 Congrats on your new baking friend, you will have many a wonderful cupcakes to make and crush now! So excited for you. Congrats on the great snow, powder runs and cool video. You rock girl! Hugs from us in NYC.